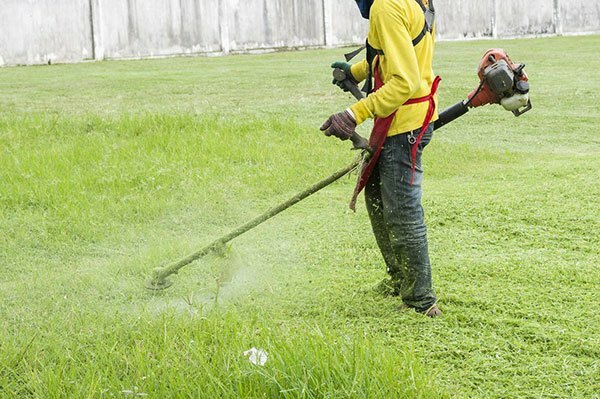 Granted, trimming your overgrown lawn is one story, but what you say if we could improve by getting it to be sharper and clean-cut at the end of it all? Using a lawn mower just to take out those extra, pesky grass is fine, but you can take it to the next level by making it more precise and otherwise “edgy” by using a lawn edger. Just what is a lawn edger, you might ask? 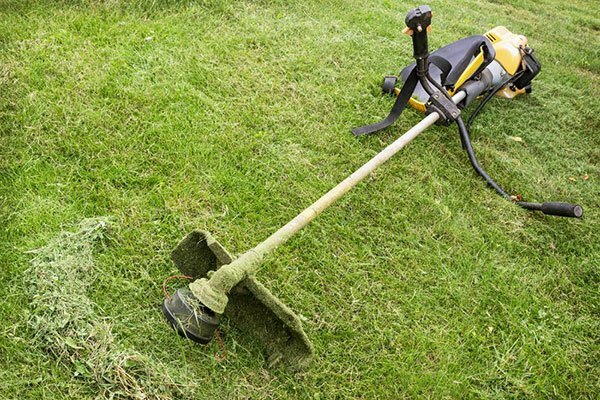 As the name suggests, a lawn edger is a piece of gardening machinery that can make your lawn and garden beds sharp and trimmed, more so than if you just use a lawn mower to clear off the supplementary inches from there. It is a useful tool to invest in, especially if you want to make your garden look good. That said, how do you go about finding the best one? True, it can be difficult to look for and purchase a good lawn edger for your specific type of garden, and although it might be daunting, taking the time to do so will benefit you in the end. Hence, we are here to help! 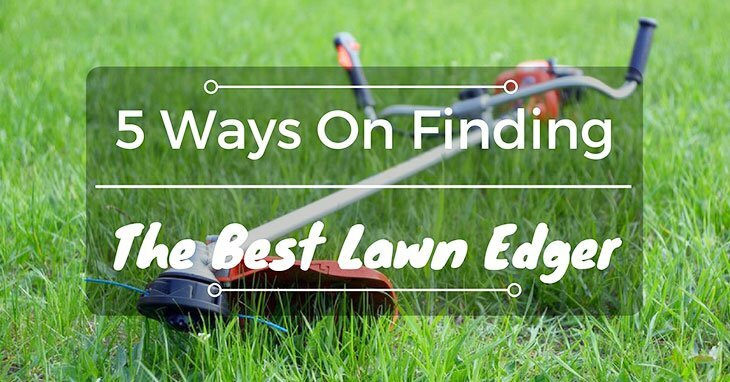 Learn more about how you can find the best lawn edger for you, as well as discover ones to help you get started. Both of these aspects refer to the size of your lawn and how much time you will be needing to invest in it. As a rule of thumb, the larger your lawn is, the more powerful your lawn edger will have to be. For size, it comes down to how large your garden perimeter is, and so if it is rather large, it might be best to get something that is heavier and more durable. On the other hand, if your garden’s perimeter is on the smaller side, then a more lightweight lawn edger will be more beneficial. For time, you might be surprised to realize that edging your lawn takes more time than you would expect. That said, it is up to you to decide if you have time on your hands to do so, and would not mind spending a whole day sprucing up those edges. If so, then a manual lawn edger would work the best; otherwise, to save time, an electric one would be practical. Lightweight and portable, electric lawn edgers are less expensive than gas ones, and they are good for those either new to lawn edging or just have a smaller garden perimeter to work with. However, they are not as fast or as powerful as the gas version, so that is one sacrifice you will have to make. On the other hand, gas lawn edgers are heavier and more powerful than electric ones, and they serve very well for large garden perimeters to edge off. The downsides are, however, they are loud and distracting, and their fuel emissions can pollute the environment, thereby contributing to an unclean atmosphere. Perhaps you might not think that having more or less of one wheel does not make a huge difference to your lawn edging experience, but in fact, it can make a notable difference in terms of flexibility and stability when being in use. Generally speaking, four-wheel lawn edgers offer the most balance and the most fixed line of work when you run it along the edge of the curb. That said, it will depend on just what you want for giving your lawn a nice and clean finish. Particularly when it comes to gas lawn edgers, having either a two or a four-cycle engine will determine just what kind of efficiency you want, in terms of operating and the environment. Two-cycle engines are a popular choice, although they require you to mix gas with oil, and overall are not very good to the environment. Four-cycle engines, on the other hand, are cleaner, but they are heavier to operate. Therefore, you will have to decide which one will work best for your lawn. As their name suggests, having one or the other blades will be up to you to choose, should you want a sharp, perpendicular finish with the straight blades or a more flexible, angled look around flower beds and other places. In the end up, it is your choosing. With a powerful PowerDrive Transmission feature and a Runtime Extension Technology, this lawn edger from Black + Decker will be sure to power through the edges of your lawn in a shorter amount of time, as well as allow for a longer run time, should you ever need it, respectively. In addition, its Automatic Feed Spool offers continuous work, so that you can keep going without needing to stop for breaks. Consists of a PowerDrive Transmission feature for an extra powerful lawn edger and shorter amount of cutting time. Contains a Runtime Extension Technology for producing a longer run time, as well as for accelerating the speed. Has an Automatic Feed Spool for continuous work, without any sort of bumping and other possible inconveniences. Might not be as powerful as it might be, especially when it comes to heavier, thicker cuts of grass that need trimming. Black + Decker’s lawn edger surprised me with its powerful features, especially when it came to trimming through the overgrown edges of the grass and getting it down in a short amount of time. It was smooth and easy to operate as well; could use a little extra power for thicker grass, but otherwise it was a solid investment. Consisting of a four-wheel, 3.5-horsepower feature, McLane’s lawn edger is a powerful piece of machinery that can be a worthwhile investment for dealing with just about any large perimeter of grass. Even more so, it is CARB Compliant, which satisfies the air-quality requirements for California, and therefore environmentally-friendly to use. Has a four-wheel base for precision and better stability when in operation. Is CARB Compliant that works hand-in-hand with promoting better air quality to the environment that you work in. Has a single-clutch blade and depth control for better management, so you can cut as shallow or as deep as you want. Filling up oil can be temperamental, since it can affect just how the machine operates. Upon purchasing and using McLane’s gas-powered lawn edger, I found it to be smooth and stable when working along the lawn edges. I also appreciate the fact that it is CARB Compliant, so that the environment will not be as affected as it can be with other products. Also enjoyed the depth control, for I was able to steer and slice through even the toughest blades. Only wished that the oil fill could be an easier process, since I was struggling with just how much to fill without causing the machinery to not operate. 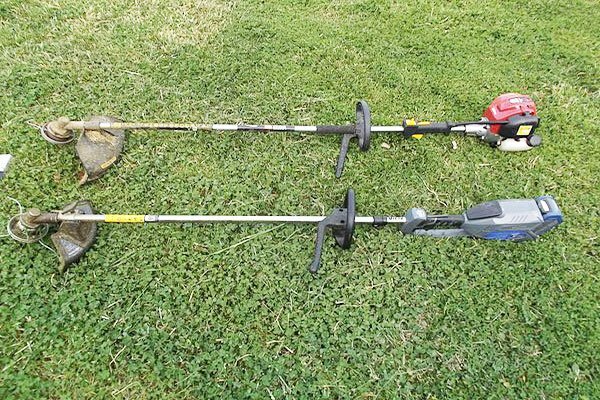 With its 3-in-1 function for trimming, edging, and mowing, this particular product from Worx certainly works like a charm with its versatility. It converts quickly between each object, and it claims to have an automatic, 100% single line feed when edging your lawn, thereby creating a smooth, unjagged line running along the curb of the lawn for an aesthetically-pleasing garden. Has a 3-in-1 function for trimming, edging, and mowing, thereby making it versatile. Contains an automatic, 100% single line feed to give your lawn a smooth and even cut along the curb. Comes with a variety of lithium batteries, trimmer spools, and a charger for backing up in the case that the machinery requires a replacement of tools. Battery life might not be as long-lasting as it is believed to be. After using Worx’s 3-in-1 product for several weeks now, I am very pleased to say that it has been incredibly useful for doing all sorts of gardening work, especially lawn edging. The parts are easy to switch out, and I enjoyed the smooth results that it has given me along my curb. One thing is that the battery life tends to be short, so I have had to constantly replace them every one or two uses. With an 8-inch blade that can cut up to 3 inches deep, Hitachi’s edger offers a lot with its 33-inch shaft attachment for promoting a better and straight-edge lawn curb for your household, as well as your neighborhood, to enjoy. Simple, but heavy-duty, it can also be a very durable item to have, especially to keep around with you for years and years to come. Contains an 8-inch blade that can slice up to 3 inches deep of grass, or any tough ones out there. Is simple, but heavy-duty, meaning that it can last quite a while in your household. Offers a clean, straight-cut lawn edge that you can be proud of showing off to others. Can be difficult to attach and put together, and it might not be compatible with other brands. As soon as I got Hitachi’s edger, I attached it on and went straight to work. It did not disappoint: while basic in design, it is heavy-duty, and it was able to cut up to 3 inches in thickness from my overgrown lawn. Although it did a good job, it was a hassle to assemble it, so that was the only downside to it. All-inclusive and powerful, this item from Black + Decker is not only good for beginners and professionals alike, but it also is compatible with both left-handers and right-handers, depending on who you are. It contains a built-in cord retention for keeping the extension cord secured and not loosened, and furthermore has a strong, 150-lb. torque for slicing through the thickest of grass. All-inclusive for beginners and professionals, left-handers and right-handers alike. Consists of a built-in cord retention for a secured extension cord. Has up to 150 lbs. of torque for digging into even the deepest grass out there. Not the greatest when navigating curbs and turns, so you will need to stop it to move and start again. Considering that I am left-handed, I was so happy that this product from Black + Decker was compatible for me. The cord retention feature was a plus, too, so that I did not need to worry about the cord popping off in the middle of my project. I would have to say, though, that it was not very effective when turning curbs; I ended up having to stop it and move it around before starting it up again, which was a hassle. Overall, the winner of this roundup goes to BLACK+DECKER LST420 20V MAX Lithium High Performance Trimmer and Edger (#1). Not only did it come with interesting and useful features, e.g. PowerfulDrive Transmission, Runtime Extension Technology, but it also keeps work going with its Automatic Feed Spool, so you ended up with smooth, even cuts all around the lawn edges. In the end, it is worth the investment. I’m glad that you talked about how it’s okay to use a smaller edger if you won’t need to use it as much. I have been looking for a new edger and I don’t know how to choose one. I’ll probably just get a light one because I only need it for my garden, and I don’t want to lift anything heavy. Could you refer to from my item?